There are 5 key steps to take when planning how your high school student will take their college admissions tests. 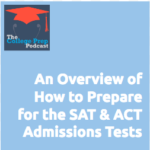 In this episode, Megan gives a detailed description for how to make a 4-year plan for managing your college admissions tests. If you have any questions or comments about this episode, please email us at collegepreppodcast [at] gmail [dot] com.